Homeopathy for benign prostate hypertrophy (BPH)? No, afraid not! Benign prostate hypertrophy (BPH) affects many men aged 50 and older. It is caused by an enlargement of the prostate resulting in difficulties to urinate and to fully empty the bladder. There are several conventional treatment options, including life-style changes that are effective. In addition, a myriad of alternative therapies are being promoted, most of which are of doubtful effectiveness. Recently, a homeopathy-promoter, Dr Jens Behnke, triumphantly tweeted a trial of homeopathy for BPH allegedly proving that homeopathy does work after all. There is no conceivable reason why homeopathic remedies should have any effect on this (or any other) condition. Therefore, I decided to have a closer look at this paper. The objective of this 5-centre, three-armed, open, randomised study was to evaluate the effectiveness of Homoeopathic Constitutional remedy (HC) and Homoeopathic Constitutional + Organ remedy (HCOM) in comparison to Placebo (PL) in patients suffering from BPH using International Prostate Symptom Score (IPSS), ultrasonographic changes in prostate volume, post-void residual urine, uroflowmetry and in WHO Quality of Life (QOL)-BREF. 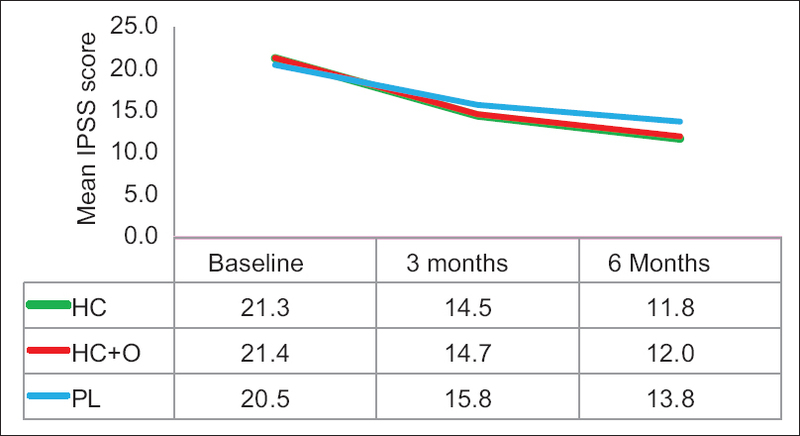 Patients were randomised into three groups in 2:2:1 ratio and were followed up for 6 months. The statistical analysis was done with modified intention-to-treat principle (mITT). Of 461 patients screened, 254 patients were enrolled in the study and 241 patients were analysed as per mITT. The mean changes in IPSS and QOL due to urinary symptoms from baseline to end of study showed a positive trend in all the three groups. However, in the HC group, the changes were more prominent as compared to the other two groups. There was no difference between HC and HCOM groups and they were equally effective in terms of managing lower urinary tract symptoms due to BPH. With regard to secondary outcome, there was no difference between the groups. The psychological, social and environmental domains of WHOQOL-BREF have shown positive trend, but there was no statistically significant difference in intervention groups. The authors concluded that statistical significance was found in the IPSS in all the three groups but only in HC and not in any of the objective parameters. yields a result that is clinically irrelevant. In other words, it does not amount to anything remotely resembling a proof of homeopathy’s efficacy.